Whether you have more questions or are ready to have me find the right person for your position, I would be happy to talk to you. Connecting is my passion. As a Portland native, I use my years of resources to put the right two people in a room together. ALEXANDER Connections offers a single source solution for clients through a vast network of professionals for all outsourced accounting and financial management services and placement needs. AC provides professional level talent for projects, contract staffing, and direct hires. By contracting with AC, companies are able to cost efficiently manage projects and hire highly trained resources who fit their corporate specific needs and culture. Small to midsize companies don't always have a need or budget for a full time CFO or Controller, but need consistent access to that level of person. ALEXANDER Connections provides access to a part time CFO or Controller that will not only have the advanced technical skills necessary for your business but also be the right cultural fit for your business on an ongoing basis. 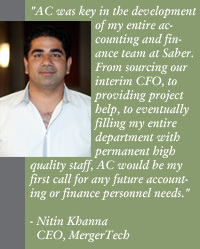 For any size company, AC provides senior level accounting and financial talent on an interim or project basis. AC also provides direct hire placement services for any level of accounting or finance position, including CFO to more entry level positions.